I-BERHAD plans to launch Grand i-Residence next year, its maiden property project in Kuala Lumpur that will generate RM500 million gross development value, its chief says. Grand i-Residence is a luxury condominium project, located on 0.43ha along Jalan Changkat Kia Peng, nearby Traders Hotel. It was originally slated for launch at the end of 2008 and called The Peak@KLCC, but was postponed due to unforeseen circumstances. Now that the company is bullish on the real estate market, it will proceed to develop it in a joint venture with land owner, Sumurwang Sdn Bhd. Sumurwang is the majority shareholder of I-Berhad, controlled and founded by Tan Sri Lim Kim Hong. Lim, via Sumurwang, bought the land at KLCC in 1993 for RM280 per sq ft.
I-Berhad is the master developer of the RM4 billion i-City here, its flagship project and only ongoing development. "We have the development order ready but there are some adjustments, like increasing the height of the building from 41 to 50 floors, with smaller units. 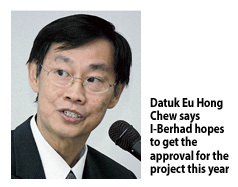 "We hope to get the approval this year and launch it in 2013," I-Berhad chief executive officer Datuk Eu Hong Chew said at a media and analysts briefing yesterday. Grand i-Residence will comprise about 450 Soho (single office/home office) units. Meanwhile, Eu said I-Berhad is talking to international mall operators to help fund and operate the one-million-sq-ft shopping complex at i-City. Eu hopes to ink a deal by year-end and start construction immediately, for completion in 2015. The four-storey mall will be developed on 5.85ha, with a hotel and three residential towers sitting on top. Building construction for the four towers will commence from 2015. Eu estimates the development cost for the mall and the four towers to be around RM700 million. I-Berhad will also be investing RM100 million over the next five years, including RM25 million to set up a children's gymnasium and a water- theme park this year.